Discussion in 'InkJet Continuous Flow Systems' started by djkokalis, Aug 20, 2018. My printer still having the issues with printing. I am beginning to think that it probably should be a printer head problem. I contacted EPSON which they advised me to send them the printer to check it themselves. The printer is still underwarranty so why not. I was asked if I was always used original cartridges so I said yes unless one time I used not genuine. What I have to do before sending the printer to EPSON? Can they see from the firmware that I was not using epson originals? 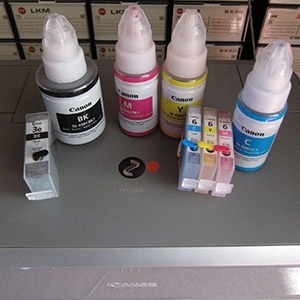 the WIC Reset utility in the status report is listing cartridge replacements separate for OEM and non-OEM cartridges for lots of printers, so use of 3rd party cartridges is stored. But this depends on the individual printer firmware, just run the utility to find out, there is no way to reset that data. One thing that I noticed you didn't confirm is whether the same nozzles re-appear as missing or not so that would be a big clue. Putting that aside though my money would be on dust, gunk and/or biological contamination. Any ideas how old the ink is and how is the ink stored when not in use... That might provide the biggest clue.